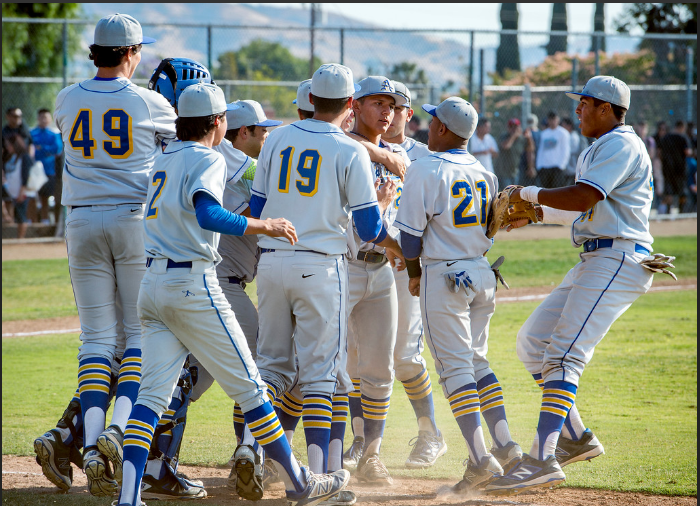 Bishop Amat’s Isaac Esqueda was called upon in the big moments and delivered for the Lancers in a nerve-wracking 3-2 victory over host Walnut to advance to Friday’s CIF Southern Section Division 3 baseball quarterfinals. Pinch hitting in the seventh inning with the bases loaded, two outs and the score tied 1-1, Esqueda doubled to left scoring Dante Castillo and Torreahno Sweet to go up 3-1. Amat’s sophomore starting lefty Diego Barrera, whose only fault had been giving up a solo homer to Quinn Cooper in the fourth inning that tied the score, 1-1, left the game in the seventh with runners on first and second and one out, handing it over to Esqueda to finish. Amat threw away a potential game-ending double play that allowed a run to score to make it 3-2, with Walnut’s Jake Rodriguez moving to second, and eventually third on a wild pitch. But Esqueda struck out Andre Alvarez to end it, and Bishop Amat (19-13) will be home in Friday’s quarterfinals against third-seed Woodbridge, a 6-2 winner over San Dimas. Both starting pitchers were fantastic. Walnut sophomore Brock Cooper had gotten clutch outs in the first three innings before Adryan Ramirez singled home Nick DiFiori for a 1-0 Lancers’ lead, which Quinn Cooper made short lived with his homer to right in the bottom half of the inning to tie it. But Barrera was just a tad better, improving to 9-2 and only allowing four hits in 6 1/3 innings. Walnut, which had advanced to the championship a year ago after knocking off San Dimas, who was undefeated and ranked No. 1 in the nation by USA Today at the time, played well enough to win, but couldn’t capitalize when it had too. “We had chances,” Walnut coach Paul Acosta said. “I respect Bishop Amat, we knew it wasn’t going to be easy, it was going to be this way, one run, and they got us. South Hills baseball wins in 11 innings: For the fifth time in the last nine years, the South Hills High School baseball team is headed to the CIF Southern Section quarterfinals. And it took 11 innings to accomplish the latest trip. In a scoreless game for 10 1/3 innings, South Hills senior right fielder Quinn Cotter ended the drought for both teams with a go-ahead, run-scoring double to left-center field, scoring junior first baseman Johnny Dearth and the Huskies defeated Paramount 3-1 in a Division 2 second-round game Tuesday afternoon. San Dimas softball trounces Edgewood: After losing to San Dimas in the CIF-SS Division 5 softball playoffs last season, Edgewood looked to avenge the loss Tuesday in a second-round rematch. But the well-rounded Saints dashed those hopes in a 15-0, mercy rule-shortened victory on the road. The Saints (18-8) scored at least once in every inning, led by center fielder Brooke Jackson, who went 3 for 5 with three RBIs, two doubles and a walk. The Saints used a balanced attack and took advantage of multiple defensive miscues with contributions from Alexandria Rodriguez (2 for 4, 5 RBIs, double) and Clarissa Reynoso (1 for 3, double, 2 RBIs). Pitcher Alondra Reynoso improved her record to 13-4. Foothill at South Hills, 3:15 p.m.
Mission Viejo at Damien, 3:15 p.m.
Woodbridge at Bishop Amat, 3:15 p.m.
Valley View at South Hills, 3:15 p.m.
Laguna Hills at Bishop Amat, 3:15 p.m.
Nogales at Louisville, 3:15 p.m.
CIF State Southern California Regional Tournament — Damien (32-8), the CIF Southern Section Division 5 champion, was swept by CIF San Diego Section Division 3 champ San Dieguito Academy (21-12), 25-21, 25-23, 25-14, in the first round. No. 2 seed L.A. Jordan (34-3) swept No. 7 El Rancho (22-7), 25-19, 25-23, 25-20. Nogales 6, Fillmore 3 — Valerie Lemus had a game-winning home run and Peui Tafasi was the winning pitcher to lead the Nobles (16-10) to advance to the CIF-SS Division 5 second-round. Boys CIF Finals: Jasher Foster is ready for a run at a CIF State track and field title. The St. Francis High School senior had to wonder at some point if it would happen. After reaching the state finals last year, he tore the meniscus in his left leg this past football season. Foster, who did not make his season debut until the midseason San Gabriel Valley Championships, won the CIF Southern Section track and field Division 3 110- and 300-meter hurdle races to earn berths in next week’s CIF-SS Masters Meet. He had personal-best times in both. Girls CIF Finals: Micah Fulton found the right time to step up.The Monrovia High School sophomore has been battling a pulled hamstring all season. The injury disappeared at the biggest meet of the year at the all-division CIF Southern Section track and field finals at Cerritos College on Saturday. Fulton tied for first in the long jump (18 feet, 6 1/2 inches) with Micheletta Forbes of Indian Springs. Fulton hit her mark on her first attempt; Forbes on her final jump. NORWALK >> This area has produced its fair share of dynasty programs. You can add another one to the list. Michael Spinney had 12 kills and Damien High School won it’s second consecutive CIF Southern Section Division 5 boys volleyball title by sweeping Laguna Blanca, of Santa Barbara, 25-18, 25-22, 25-23, at Cerritos College. Jack Mitchner had 25 assists and Daniel Enriquez and Marco Rodriguez-Fleishman had five kills each for the Spartans, who improved to 32-7. Damien, which beat Arrowhead Christian for the Division 5 title last season, dominated the playoffs, sweeping four of their five matches, only pushed to five sets by Santa Fe in the quarterfinals. The Spartans are also eligible for the CIF State Southern California Regionals, which begin next week. The pairings will be released Sunday. “It feels great,” Spinney said. “We knew coming into the season we had a good chance. I’m just happy we were able to fulfill it. 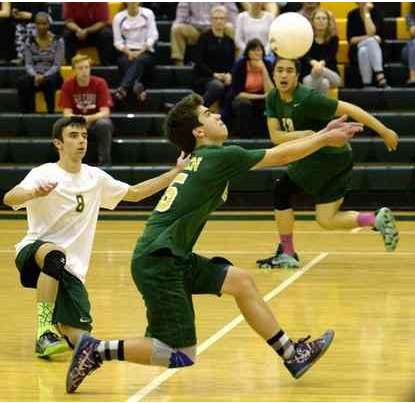 The Spartans used the same formula in each set — breaking away during the mid-point to close strong and win. Damien, after falling behind to begin the third set, used a 7-3 surge to rally for a 17-15 lead. The Spartans, getting an ace from Mitchner and a kills from Spinney and Enriquez, then closed the match by winning six of the final nine points, including a spike by Enriquez down the middle that began the celebration. “That’s how we’ve been able to play,” said Damien coach Randy Bohlmann, whose program also boasts four consecutive league titles. “In the quarterfinals, we had some match points against us against Santa Fe. We were able to withstand those and win the match. The Spartans used a 7-3 surge to break free from a 12-12 tie for a 19-15 lead in the first set. Damien then won the final five points, getting an ace by Nick Hibshman and a kill by Andrew McCarson, to win, 25-18. Laguna Blanca, which got 14 kills from Philip Fauntleroy and 13 from Chris Costantino, scored seven of the first 11 points in the second set. But couldn’t withstand another Damien blitz. The Spartans, getting kills from Spinney and Rodriguez-Fleishman, then countered with an 8-3 surge to lead, 12-10. Damien, after pushing it to 19-15, then closed the set with a 6-4 run, winning it on a kill by Enriquez. The Spartans then clinched the match by winning the final two points of the third set. La Salle 8, Rancho Alamitos 3 — Zane Lindeman was the winning pitcher, Ryan Garcia went 2 for 3 with two RBIs, and Sammy Martinez went 2 for 2 with a double and an RBI for the Lancers (20-7) in a CIF-SS Division 3 first-round win. Eric Zimmerman went 3 for 4 with two RBIs and Joel Brown went 2 for 4 for La Salle.